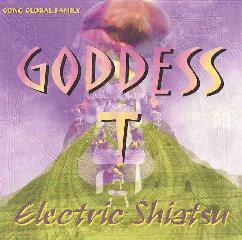 Goddess T - "Electric Shiatsu"
Both Daevid Allen and Gilli Smyth have been very busy lately with various projects, including new 'trilogy Gong' material. Goddess T sounds much like a second Mother Gong, but with other protagonists in tow, including Orlando Allen (presumably their offspring), Nick Spacetree, and Tone. Along with Daevid's gliss, recent Gong guitarist Mark Hewins also makes a guest appearance. Perhaps 'Electric Shiatsu' is a little less silly and pretentious than the 'Robot Woman' stuff, but there is plenty of Gilli's eccentricity on display. For instance, "Triple Helix" talks of "another secret strand of DNA"... I guess the X-Files airs in the UK. The music is an equal mixture of sitar & tabla psychy trance and pure techno-tronics. So not surprisingly, my reaction is 50:50. Whereas the subtle, groovy and eerie music in "Sugar Path" is a pleasant backdrop for Gilli's poetry, "Sirius Ma" is the kind of pulsating techno music that I really hate, and the screechy violin sounds don't help matters. And "It's a Strange Place Here" was ok at the beginning as 'ethnic trance,' but "Part Two" is basically a techno remix which makes me gag, no matter how cool Daevid's gliss is. The album ends strong though with the 20-minute "Journey of the White Whale"... lots of gliss and drone (and whales! ), and very spacey!! Gilli whispers "Remember" over and over, as if planting a suggestion in our head to visit Planet Gong next summer. I'll make my reservations now for Gong 2000. So take two or three of these pieces, and compile them with some of the better Mother Gong material, and you'd have something I could recommend. Otherwise, I'd have to suggest selective listening.